This was an early assignment from Bay Cities, the beloved but short-lived label that unearthed great American classical music and also did a number of soundtracks. 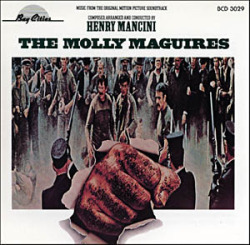 Henry Mancini broke out of his “romantic comedy” mold with this melancholy score for the Richard Harris-Sean Connery movie about Irish-American miners in 19th-century Pennsylvania. I remember interviewing Mancini about the project — and that the studio demanded my notes be “edited” to excise any reference to the discarded Charles Strouse score.